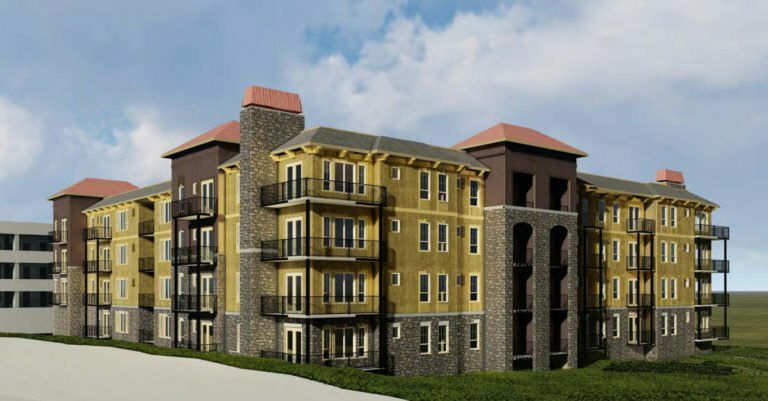 The El Dorado County Planning Commission approved a modified plan to bring the El Dorado Hills Apartments to Town Center by a 3-2 vote, with District 1 Commissioner Jon Vegna and District 4 Commissioner James Williams voting to deny it. The majority vote paves the way for the project to go to the Board of Supervisors for a final decision. Stockton-based developer Spanos Corporation revised the original plan after the project was denied by the Planning Commission in 2014 but later conceptually approved by the Board of Supervisors. A lawsuit, which is still pending, halted that decision. The El Dorado Hills Apartments project is planned for the 4.6-acre undeveloped lot in the heart of Town Center. For approval it needs, among other things, a General Plan amendment since the project calls for 47 dwelling units per acre. The parcel’s current General Plan land use designation allows a maximum of 24. When the project was first proposed in 2014 developers designed it with 56 units per acre. The four-story luxury apartment complex is 15 percent less dense today, with 214 units, ranging from studio to one-bedroom and two-bedroom apartments. Perhaps the biggest revision, last Thursday Spanos spokesman Jeff Morgan said they have listened to the community’s concerns and have volunteered to mitigate traffic by installing a lighted traffic signal at the four-way stop at Post and Vine streets before construction begins. Previously Morgan said the developer would pay for a traffic signal should it become necessary. “This is not a requirement, but because of community concerns we’ll go above and beyond to ensure a better Level of Service from day one,” he explained, adding that they are already in talks with the Department of Transportation to make it happen. The plan consists of two 60-foot-tall, four-story apartment buildings, outdoor recreation areas and an informal open space area. There would also be a four-story, 60-foot-tall parking structure that would house on average 1.9 cars per studio and one-bedroom unit and two spaces for every two-bedroom unit. Previously there were 1.7 spots planned per unit. “We brought down the density and brought up the parking spaces,” Morgan added. Morgan also identified what he called community benefits to the project, including a walkable environment, an alternate housing choice and that it would provide economic stimulus and employment to the area. The project has been described as an ideal place for empty nesters and young professionals. Except for one resident who spoke in favor of it, the mother of a college-age son who wants him to consider living in El Dorado Hills after graduation, all the proponents who spoke at Thursdays meeting are employees of the El Dorado Hills Chamber of Commerce or the El Dorado County Chamber. They argued that it would revitalize Town Center and give a boost to its businesses. Opponents’ main arguments continue to be the project’s density — that approval would set a precedent for a doubling of density for other projects in the county — and traffic, specifically that there is already limited parking in Town Center and that an influx of residents and their guests could potentially halt the flow of traffic. APAC chairman Tim White said a hotel would be a better use of the site. “Guests at a hotel would be more likely to visit Town Center businesses and the county would benefit from the Transient Occupancy Taxes and sales taxes,” he explained. But the majority went with a vote to approve the plans.